Whether you're a skateboarder, artist, or both, we've got just what you need to complete your portfolio of skateboard decks / artwork. Our bundle of 5 blank skate decks comes with 5 wall mounts - turn the decks into works of art and mount them in your house as the perfect skate-inspired decoration. Customize them however you want to fit any room in your house, or turn your art skills into a business by decorating the decks and selling them online. 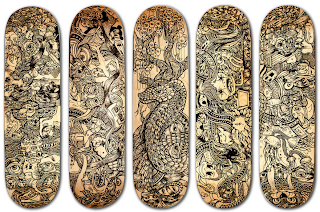 Make a great Christmas present for the skateboarder or artist in your life. 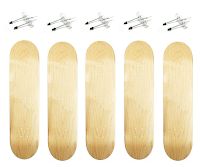 This bundle includes (5) of our wildly popular floating skateboard deck displays and (5) blank skateboard decks. The skateboard deck displays are a patented rack that use the skateboard truck's mounting holes to hold the board off the wall giving it the illusion that it is floating. The blank decks are high quality, American made 7-ply Northern Hardrock Maple boards. These decks will all come with a blank, unfinished bottom sheet and a colored top sheet. The top sheet colors are assorted, but when using the deck display, only the bottom sheet is visible so the top sheet color doesn't really matter.